The concentrations and chemical compositions of volatile organic compounds (VOCs), including volatile fatty acids, phenols, indoles, aldehydes, and ketones, which are the main organic compounds generated by swine, were investigated in July and October 2016 and January 2017. In addition, the emission rates and annual emissions of these components from the swine shed were estimated. The concentrations of VOCs in the swine shed averaged 511.3 μg m-3 in summer, 315.5 μg m-3 in fall and 218.6 μg m-3 in winter. Acetone, acetic acid, propionic acid, and butyric acid were the predominant components of the VOCs, accounting for 80-88% of the total VOCs. The hourly variations of VOC concentrations in the swine shed in fall and winter suggest that the VOC concentrations were related to the ventilation rate of the swine shed, the activity of the swine, and the temperature in the swine shed. Accordingly, the emission rates of VOCs from the swine shed were 1-2×103 μg (h kg-swine)-1. The average concentrations of PM2.5 in Japan have been decreasing in recent years. However, environmental quality standards are still not met at 50% of the monitoring stations in Japan (Ministry of the Environment, Japan, 2014) and localized air pollution remains a concern. Among environmental pollutants, organic compounds are one of the major components of PM2.5, accounting for 22% of the total PM2.5 (Ministry of the Environment, Japan, 2014). The organic compounds in PM2.5 have a cooling effect on the Earth’s surface by reflecting sunlight (VanReken et al., 2005). In addition, polar organic compounds in PM2.5, such as those with carboxyl groups, have the potential to act as cloud condensation nuclei, which form cloud droplets (Nga et al., 2005). Therefore, organic compounds in PM2.5 are an area of concern for climate and air quality. In addition, the particle sizes of organic compounds in PM2.5 are in the range of 0.1-1 μm, which is smaller than that of the inorganic constituents. Therefore, the organic compounds in PM2.5 tend to have a long residence time in the atmosphere and can be transported over long distances, thus impacting the atmospheric environment on a global scale. In Japan, however, the measured concentrations of organic compounds in PM2.5 tend to be larger than the estimated values calculated by an atmospheric diffusion model (Morino et al., 2010), suggesting that unidentified semi-volatile organic compounds or multiphase chemistry may contribute largely to anthropogenic secondary organic compounds. Besides the possibilities described above, other non-negligible emission sources of organic compounds might not have been incorporated into the model. Livestock breeding could be a contributing source of organic compounds in PM2.5. Over 300 VOCs have been identified in the air at livestock facilities (Shiffman et al., 2001). These VOCs are emitted from several sources, including the animals themselves (via their expirations and excretions) and their feed (Alanis et al., 2010; Ngwabie et al., 2008). Under anaerobic conditions in the large intestine of livestock, volatile fatty acids (VFAs) are produced from carbohydrates (Powers et al., 1999; Williams, 1984), and phenols and indoles are produced from proteins through microbial fermentation (Spoelstra, 1980). Some of these compounds are absorbed and used for metabolism, and unutilized nutrients and endogenous compounds in the gastrointestinal tract are excreted via the breath and manure. Spinhirne et al. (2004) reported the presence of 21 VOCs, such as acetic acid and acetone, in bovine breath. Parker et al. (2013) reported that eight VFAs, five phenols, and three sulfides were emitted from swine manure. Shaw et al. (2007) concluded that nonmethane VOCs make up about 1.3% of the total organic compounds emitted from cattle and their excretions. In addition, animal feeds such as silage, which is made from grass crops and fermented and stored in a process called silaging, could also be an important emission source of VOCs, especially acids, alcohols, and aldehydes (Harfner et al., 2013). Therefore, stockbreeding could be a significant emission source of VOCs in the atmosphere. In this context, VOCs emitted from stockbreeding have been estimated to account for 9.6% of the total VOC emissions in the state of California (CDPR, 2006). VOCs are known to form photochemical oxidants and secondary particulate matter and contribute to PM2.5 formation. In particular, the rate constants for the hydroxy radical reaction are high for aldehydes (DeMore et al., 1994), so they have a high propensity to form particulate matter. Therefore, emissions of aldehydes could have a large effect on the concentrations of PM2.5, and stockbreeding could be a significant emission source of organic compounds in PM2.5. However, little is currently known about emissions of VOCs from stockbreeding in Japan. The objective of this study was to clarify the extent of emissions of organic compounds from stockbreeding in Japan. Such VOC emissions are thought to be influenced by environmental factors such as temperature and humidity as well as the operational protocols used at each facility (Yao et al., 2011). In this study, we focused on swine, a major livestock in Japan, and measured the concentrations and chemical compositions of VFAs, phenols, indoles, and aldehydes, which are the main VOCs in swine sheds. In addition, the emission rates of these components from the swine shed were estimated. Quantifying the VOC emissions from stockbreeding should provide new information on the sources of organic compounds in PM2.5 and should aid in the development of effective air pollution control strategies. Target compounds in this study were eight VFAs (acetic acid, propanoic acid, isobutyric acid, butyric acid, isovaleric acid, valeric acid, hexanoic acid, and heptanoic acid), three phenols (phenol, 4-ethylphenol, and 4-methylphenol), two indoles (indole and skatole), eleven aldehydes (formaldehyde, acetaldehyde, acrolein, propionaldehyde, crotonaldehyde, methacrolein, n-butyraldehyde, benzaldehyde, valeraldehyde, m-tolualdehyde, and hexaldehyde), and two ketones (acetone and 2-butanone). The standards for VFAs, phenols, and indoles, obtained from Wako Pure Chemical Industries, Kanto Chemical, or Sigma-Aldrich, were dissolved in methanol (dioxin analysis grade, Wako Pure Chemical Industries). The aldehyde and ketone standards consisted of a mixture of 11 aldehydes and two ketones, which were derivatized with 2, 4-dinitrophenylhydrazine (DNPH, Sigma-Aldrich) and dissolved in acetonitrile (HPLC analysis grade, Wako Pure Chemical Industries). Hydrochloric acid (special grade, Wako Pure Chemical Industries) was used to extract aldehydes. Samples were collected from a swine shed at Asahi Agricultural High School located in northeastern Chiba, Japan. Fig. 1 shows the plan and side views of the swine shed. The volume of the shed was 499 m3 (width: 10.4 m; depth: 19.8 m; height: 3.0 m). The shed featured a natural ventilation system. Windows were opened all day in summer and from 8 a.m. to 5 p.m. in fall, whereas in winter the windows were closed all day. The floor of the facility was concrete and was not covered with straw. Swine waste on the floor was removed daily just after 9 a.m. Layout of the swine shed. Landrace swine, a typical breed in Japan, of 15-180 days old, were raised in the shed. The number and total weight of the swine are shown in Table 1. During the sampling campaign in fall, nine swine with an average weight of 6 kg head-1 were added to the swine shed, and so the number and total weight of the swine changed. Each day, the swine were fed 1.5-3.0 kg head-1 of formula feed (Attaku-kobuta, Marubeni Nisshin Feed), which consisted mainly of grain and vegetable oil meal (see Table S1) and was split into two portions and provided at 7:30 a.m. and 4 p.m. Swine were able to drink water freely at any time from watering stations within the facility. Number and total weight of swine during the sampling campaigns in this study. Air sampling from the swine shed was conducted in summer (July 2016), fall (October 2016), and winter (January 2017) for four or five days in each season. Samples of VFAs, phenols, and indoles were collected with stainless steel or glass sorbent tubes filled with Tenax TA® sorbent (3.5 in.×0.25 in. OD, 60/80 mesh, COMSCO). Prior to sample collection, all tubes were conditioned by flowing a stream of pure nitrogen gas at a flow rate of 50 mL min-1 for 60 min at 300°C. Air sampling was conducted at 11 points in the shed, as shown in Fig. 1. Air in the shed was pulled through the sorbent tube at a flow rate of 0.1 L min-1 for 30 min with a vacuum pump (MP-Σ30NII, Sibata Scientific Technology) at 12 a.m., 8 a.m., 12 p.m., and 4 p.m. in each season. Additionally, in fall and winter, air in the shed was collected every hour for 24 h at the center of the shed (point 1) to study the hourly variation. After sampling, the sorbent tubes were sealed at both ends with stainless steel caps and put into an aluminum bag with a zipper and kept in a cool, dark place. Throughout the sampling campaign, conditioned sorbent tubes used as travel blanks were transported and stored with the samples. Field blank samples were also collected from the sampling site (point 1) to expose them to the ambient field conditions for 1 h to fit the sampling condition to every 1 hour sampling continued for 24 hours performed in fall and winter. After that, sorbent tubes were sealed at both ends with stainless steel caps and stored in the same way as the samples. Furthermore, sampling was performed in the shed with two identical tubes placed in series at a flow rate of 0.1 L min-1 for 30 min to test for breakthrough of VFAs, phenols and indoles. Gaseous aldehydes and ketones in the shed were collected with the DNPH cartridges containing DNPH-derivatizing agents (InertSep mini AERO DNPH-LG, GL Sciences). An ozone scrubber cartridge (InertSep mini AERO OzoneScrubber, GL Sciences) was connected upstream of the two DNPH cartridges. Air in the shed at sampling point 1 (Fig. 1) was flowed through the cartridges at a flow rate of 0.1 L min-1 for 30 minutes at 12 a.m., 8 a.m., 12 p.m., and 4 p.m. in summer and from 8 a.m. to 4 p.m. and 4 p.m. to 8 a.m. in fall and winter. After sampling, the DNPH cartridges were sealed at both ends and kept in an aluminum bag with a zipper and placed in a cool, dark place. Field blanks were processed along with the sorbent tube sampling. The air temperature and RH inside and outside of the shed were measured with hygrothermographs (RTR-503, T&D, ±0.3°C, ±5%RH). Monitoring points for both sensors were located about 1.2 m above the ground (Fig. 1). The hygrothermograph unit outside of the shed was covered with tin foil to avoid direct sunlight and rain. Measurements were performed every 10 min in summer and every 1 min in fall and winter during the sampling campaign. Temperature and RH were calibrated based on the differences of the averages obtained for each hygrothermograph for simultaneous measurement at the same sampling point (Eq. 1a, 1b). where Tout' and RHout' are the calibration values. εT and εRH were - 0.23°C±0.08°C and -0.73%± 0.52%, respectively. VFAs, phenols, and indoles were analyzed by gas chromatography-mass spectrometry (GC/MS; GCMS-QP2010, Shimadzu Corporation) equipped with a thermal desorption injector (TD-GC/MS; TDTS-2010, Shimadzu Corporation). An InertCap WAX capillary column (30 m×0.25 mm×0.25 μm, GL Sciences) was used for separation. The flow rate of helium carrier gas was 1.4 mL min-1 in the constant pressure mode. Chemical substances collected on the adsorbent were desorbed for 3 min at 230°C with a purge flow of 50 mL min-1 and trapped at - 20°C. The cold trap was rapidly heated to 230°C and the trapped chemical substances were injected into the GC/MS. The GC oven temperature program was as follows: 40°C (hold 3 min) → (ramp 8°C min-1)→230°C (hold 5 min). The temperatures of the injection port and the ion source were 200 and 210°C, respectively. The samples were analyzed using selected ion monitoring mode. For signal quantitation, standard solutions of these compounds at 1, 10, and 100 ng μL-1 were analyzed by TD-GC/MS. Aldehyde and ketone samples were processed before analysis. Strong cation (SC) cartridges of SC exchange resin (InertSep mini AERO SC, GL Sciences) were conditioned with 5 mL acetonitrile, 5 mL purified (ion-exchanged) water, 20 mL 0.1 M hydrochloric acid solution, and 5 mL acetonitrile. After conditioning, the SC cartridge was connected downstream of the DNPH cartridge and the DNPH derivatives were eluted with 5 mL acetonitrile at a flow rate of 1 mL min-1. The eluent was concentrated and the volume adjusted to 1 or 10 mL with acetonitrile prior to analysis by high-performance liquid chromatography (HPLC) with UV detection (HP 1100, Hewlett Packard, equipped with an InertCap WAX capillary column [Deltabond Resolution AK, 200 mm×4.6 mm×5 μm, Thermo Fisher Scientific]). The oven temperature was maintained at 40°C throughout the separation. Acetonitrile (A) and acetonitrile solution (B) containing 10% water were used for the eluents. The gradient was performed as follows: A/B=35%/65% to 65%/35% (0.0→ 35.0 min), 65%/35% to 80%/20% (35.0→ 35.2 min), 80%/20% (35.2→ 40.0 min), 80%/20% to 35%/65% (40.0→ 40.2 min), and 35%/65% (40.2→ 45.0 min). The detection wavelength for the UV absorption signal was 365.8 nm. For quality control, standard solutions of aldehydes and ketones at concentrations of 0.375 to 15 μg mL-1 were analyzed by HPLC using the same conditions as described above. Emission rates of VOCs from the shed were evaluated using Eq. 3.
where Vc (m3) is the volume of the shed, Vin (m3 s-1) is the volume of intake air of the shed, Vout (m3 s-1) is the volume of exhaust of the shed, xi (kg kg-1) is indoor absolute humidity, x0 (kg kg-1) is outdoor absolute humidity, vi (m3 kg-1) is the specific volume in the shed, v0 (m3 kg-1) is the specific volume exiting out of the shed, and Wg (kg s-1) is the amount of moisture emission. The absolute humidity and specific volume were determined from the air temperature and the RH inside and outside of the shed using a psychrometric chart. Moisture emission, that is, the amount of moisture to be removed from the room, was referred to the regression equation reported by Bond et al. (1959). Bond et al. (1959) calculated the moisture emission from the known air-flow rate and the difference in moisture content between the entering and the exhaust air, followed by statistical analysis of the data and then development of a series of continuous curves. Moisture emission is converted to room latent heat by multiplying the moisture released from the swine by the latent heat of vaporization at the swine body temperature, and by multiplying the moisture picked up from the urine, feces, and so on by the latent heat of vaporization at the room air temperature (Bond et al., 1959). Thus, moisture emission was estimated from the regression curves for the weight of one swine and the temperature in the shed. where Δt is the time interval, xi* is the indoor absolute humidity after t min, and vi* is the specific volume in the shed after t min. On the assumption that the air in the shed was at a steady state, Eq. 4 could be re-written as Eq. 7. The ventilation rate of the shed was estimated according to Eq. 7 on the assumption that the air exhaust is equal to the air intake. Extremely large ventilation rates, whose values were calculated to be ≥10 times larger than adjacent data collected immediately before or after were regarded as outliers, were removed. The amount of total annual emissions of VOCs from the shed was estimated according to Eq. 8.
where N (g/year) is the amount of total annual emissions of VOCs from the shed. The mean temperature and RH inside and outside of the swine shed, the mean differences in temperature and RH inside and outside of the shed, the mean absolute humidity and the mean specific volume inside and outside of the shed, and the mean moisture emission and the mean ventilation rates during the sampling campaign are shown in Table 2. In addition, the minimum and maximum temperatures, the RH, the absolute humidity and the specific volume are shown in parentheses. The mean temperatures inside and outside of the shed were highest in summer and lowest in winter. Hourly variations of temperature in the shed were lower inside than outside in each season. The mean ventilation rates per head were 384 m3 h-1 per head in summer, 153 m3 h-1 per head in fall, and 273 m3 h-1 per head in winter. Dokoshi et al. (1983) reported the mean ventilation rates for a modified open-front swine shed (volume: 332 m3) with a natural ventilation system that was similar to the one in this study; values were 450 m3 h-1 per head in summer and 49 m3 h-1 per head in winter. The ventilation rates in summer and fall in this study were of similar magnitude to the levels in summer reported by Dokoshi et al. (1983). However, the rate in winter in this study was 10 times larger than that reported by Dokoshi et al. (1983) as the ventilation rate could be influenced by the ambient air conditions. Climatic conditions inside and outside of the swine shed during the sampling campaigns. The average concentrations of total VOCs in the center of the shed are listed in Table 3. In addition, the chemical compositions of the VOCs measured at the center of the shed are shown in Fig. 2. In addition, total concentrations of each VOCs (ΣVFAs, Σphenols, Σindoles, Σaldehydes, and Σketones) are shown in Fig. 3. In winter, the average concentration of VFAs, phenols, and indoles measured every hour for 24 h (i.e., 174.5 μg m-3) was close to the average concentration of these compounds measured for 30 min at 12 a.m., 8 a.m., 12 p.m., and 4 p.m. (i.e., 189.0 μg m-3). Thus, the average concentrations of total VOCs in the center of the shed in each season (Table 3) were calculated using the results of the latter. The total VOC concentrations ranged from 167.2 to 1603.1 μg m-3 (average: 511.3) in summer, 94.5 to 537.8 μg m-3 (average: 315.5) in fall, and 40.8 to 503.1 μg m-3 (average: 218.6) in winter, decreasing from summer to winter. The VFAs concentrations were 204.4 μg m-3 in summer, 171.6 μg m-3 in fall, and 156.6 μg m-3 in winter. The phenol concentrations were 15.6 μg m-3 in summer, 11.0 μg m-3 in fall, and 17.8 μg m-3 in winter. The indoles were not detected or were detected at very low concentrations in each season. 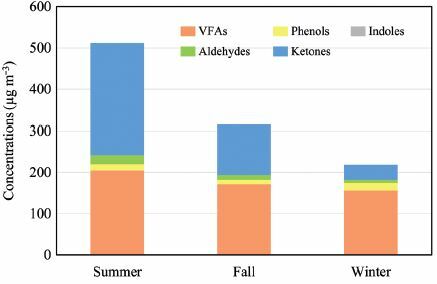 Aldehydes concentrations were 21.6 μg m-3 in summer, 10.8 μg m-3 in fall, and 8.2 μg m-3 in winter, and ketones concentrations were 269.7 μg m-3 in summer, 122.1 μg m-3 in fall, and 36.0 μg m-3 in winter. Acetone, acetic acid, propionic acid, and butyric acid were the predominant components of the VOCs, accounting for 80-88% of the total VOCs. These seasonal variations of VOC concentrations may be related to variations in the numbers of swine, the volatilization volume, and the ventilation rate. VOC concentrations (μg m-3) in the center of the swine shed in each season. Concentrations and compositions of VOCs at the center of the swine shed for each season. Concentrations of each VOC in the swine shed for each season. (a) VFAs. (b) Phenols. (c) Indoles. (d) Aldehydes. (e) Ketones. Concentrations were measured at the center of the swine shed (Point 1). The concentrations and chemical profiles of the VOCs in this study were similar to that found in a previous study by Feilberg et al. (2015). Mårtensson et al. (1999), however, reported that the concentration of eight VOCs (lactic, formic, acetic, propionic, isobutyric, butyric, isovaleric, and valeric acids) in a swine shed, where there was a higher cultivation density and a lower frequency of cleaning, was 3975 μg m-3, which is higher than the concentration found in the present study. In a study by Yao et al. (2011), the concentrations of nine VOCs (skatole, indole, p-cresol, and acetic, propionic, isobutyric, butyric, isovaleric, and valeric acids) in a swine shed ranged from 0.07 to 2 μg m-3. Such differences in analytical data could be accounted for by differences in the experiments, including the systems for storage of manure, the breeds of swine, and the ventilation systems (mechanical ventilation). Consequently, concentrations and chemical components in the swine shed could be affected by the breeding methods and the types of ventilation systems. Fig. 4 shows the concentrations of VFAs, phenols, and indoles at 11 sampling points in the shed (Fig. 1) in winter. The mean concentration for the 11 sampling points, 321 μg m-3, was close to the value obtained for the center of the shed, 249 μg m-3. Furthermore, any sizeable concentration gradients in the shed would become small due to an increased ventilation rate in the summer compared with that in winter. Thus, the concentrations of these compounds in the center of the shed would approach the mean concentration value in the shed. On the assumption that the concentration at the center of the shed was approximately equal to the mean concentrations at the other sampling points in the shed, the emission rates (discussed in the Section 3.3) were estimated based on the data for the center of the shed. Given that aldehydes and ketones, which are VOCs, are expected to behave similarly to VFAs, phenols, and indoles, the emission rates and national annual emissions inventory for aldehydes and ketones were also estimated on the same basis. Concentrations of VFAs, phenols, and indoles at each sampling point in the swine shed in winter (n=6). The red line indicates the mean concentrations of VFAs, phenols, and indoles for the 11 sampling points. As shown in Fig. 4, the concentrations of VFAs, phenols, and indoles measured at the higher sampling points (points 6-8) were higher than at the lower points (points 1-5), notwithstanding the fact that these compounds have a greater specific gravity than air. A possible explanation for this is that the expiration and excretion, which are main emission sources of VFAs, phenols, and indoles, are emitted at the temperature of the swine’s body, which is higher than that in the animal’s immediate vicinity. Hence, there would be a tendency for these compounds to undergo convective transport in an upward direction. However, mixing of the air in the shed would be incomplete because the temperature of the upper boundary layer in the shed would be higher than that of the lower boundary layer. Consequently, there would be a tendency for VFAs, phenols, and indoles to accumulate in the upper boundary layer. Furthermore, it was noted that the concentrations of VFAs, phenols, and indoles measured at the northernmost sampling points (points 9-11; 264 μg m-3) tended to be lower than those for sampling points at the southernmost locations (points 1-5; 300 μg m-3) as the swine were kept only on the southern side of the shed for the experimental campaign in the winter, though the differences were not appreciable. 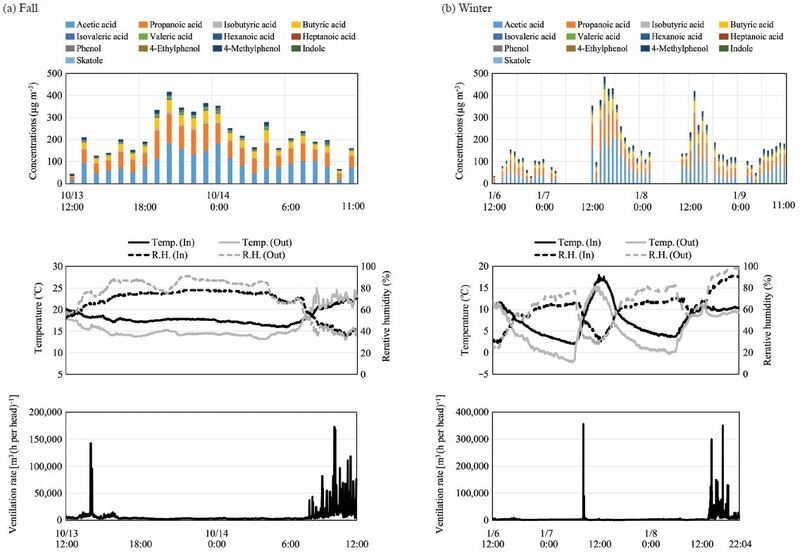 The hourly variation of the concentrations of VFAs, phenols, and indoles and meteorological conditions in the shed in fall and winter are shown in Fig. 5. In fall, the concentrations during the day were lower than those at night. The ventilation rates were specifically increased during the day by opening the windows and doors of the shed. Thus, the differences of concentrations between day and night may reflect a decrease in ventilation at night due to the closing of the windows from 5 p.m. to 8 a.m. During this period, the concentrations of VFAs, phenols, and indoles increased for the 7 p.m. to 12 a.m. period and around 4 a.m. and 7 a.m. The concentrations of these compounds were relatively high for the peaks around the 7 p.m. to 12 a.m. period and at 7 a.m. because VOC generation in the shed was greater than the outflow losses due to the closing of the windows in the evening. After the swine lay down to rest, the relation between the VOC generation and the outflow emission changed and the concentrations of VFAs, phenols, and indoles decreased. The following morning, with the swine waking up and becoming active, VOC emissions and manure volume increased with the result that the concentrations of VFAs, phenols, and indoles increased temporarily. After the opening of windows, the ventilation increased, resulting in an increased outflow of those VOCs, thus reducing the VOC concentrations. The reason for the peak at 4 a.m. was not clear. Hourly variations of concentrations of VFAs, phenols, and indoles along with meteorological conditions in the swine shed in fall and winter. (a) Fall. (b) Winter. In winter, measurement of air temperature and relative humidity was stopped at 22:04 on January 8. Therefore, ventilation rates were estimated only until then. During winter, the concentrations of VFAs, phenols, and indoles peaked at 3 p.m. to 4 p.m. and decreased at night. The ventilation rates increased occasionally with the opening the doors of the shed. However, the windows were basically closed all day, so variations in ventilation were relatively small (Fig. 5). Thus, the concentrations of VFAs, phenols, and indoles were greatly influenced by variations in the generation of VOCs rather than changes in ventilation. Clearly, the physical activity of the swine was greater during the day than during the night. The increased activity of the swine increased respiration volume, the amount of sweat, and the amount of manure, which are the main sources of VOC emissions. Possible reasons for increased concentrations of VFAs, phenols, and indoles during the day include the following: 1) the swine’s activity was greater during the day than at night, resulting in an increase in respiration volume and sweat; 2) excretion of manure; and 3) dispersal of the manure by the swine. In addition, an increase in the volatilization volume of the VOCs and an increase in the respiration volume with increasing temperature might affect the VOC concentrations. Huffel et al. (2016) reported that the concentrations of VOCs in a swine shed were high in the late evening, when ventilation had decreased, and were low in the early morning and around noon, before the swine’s activity peaked. Trabue et al. (2011) reported the concentrations of VOCs exhibited a diurnal pattern with maxima occurring in the early morning (6-8 a.m.) and late evening periods (7-11 p.m.), when wind speed decreased. These results are similar to the present data in terms of the hourly variations of VOC concentrations, which were mainly affected by the ventilation rate and the activity of the swine. The mean emission rates of VOCs from the shed in each season were estimated as 1-2×103 μg (h kgswine)-1, as shown in Fig. 6. Summer had the highest VOC emission rate (2211 μg [h kg-swine]-1), followed by winter (1915 μg [h kg-swine]-1) and fall (1037 μg [h kg-swine]-1). The VFA emission rates were 1526 μg (h kg-swine)-1 in summer, 490 μg (h kg-swine)-1 in fall and 1442 μg (h kg-swine)-1 in winter. The phenol emission rates were 114 μg (h kg-swine)-1 in summer, 29 μg (h kg-swine)-1 in fall, and 175 μg (h kg-swine)-1 in winter. As indoles were detected at very low concentrations for each season, the emission rates were very low. The aldehydes emission rates were 75 μg (h kg-swine)-1 in summer, 23 μg (h kg-swine)-1 in fall, and 46 μg (h kg-swine)-1 in winter. The ketone emission rates were 496 μg (h kg-swine)-1 in summer, 494 μg (h kg-swine)-1 in fall, and 252 μg (h kg-swine)-1 in winter. The emission rates of VOCs from the shed depended on the concentrations and the ventilation rates derived from equation 1. Furthermore, the concentrations and ventilation rates were influenced by meteorological conditions, such as air temperature and RH inside and outside of the swine shed, as shown in Fig. 5. In this study, the emission rates of VOCs in the summer were higher than those in the fall and winter. A possible reason for the seasonal variation could be the increasing activity of swine and the increasing volatilization volume with increasing temperature. Amon et al. (2007) reported that the VOC emissions in winter (mean temperature in the swine shed: 19.7-21.4°C) were 40-60% lower than those in summer (22.5-24.1°C). Other studies (Borhan et al., 2012; Feilberg et al., 2012) have also reported the same relationship between temperature and emission rates; that is, the higher the temperature, the higher the emission rates of VOCs. Emission rates of VOCs from the swine shed. However, the emission rates for VOCs were lower in fall than in winter, despite the higher temperatures in fall. The emission rates depended on the ventilation rates and the VOC concentrations of the shed (Eq. 1). The ventilation rates in winter were about 1.8 times higher than in fall, whereas the VOC concentrations in fall were about 1.6 times higher than in winter. Therefore, in winter, the higher emission rate might be affected mainly by the higher ventilation rate. 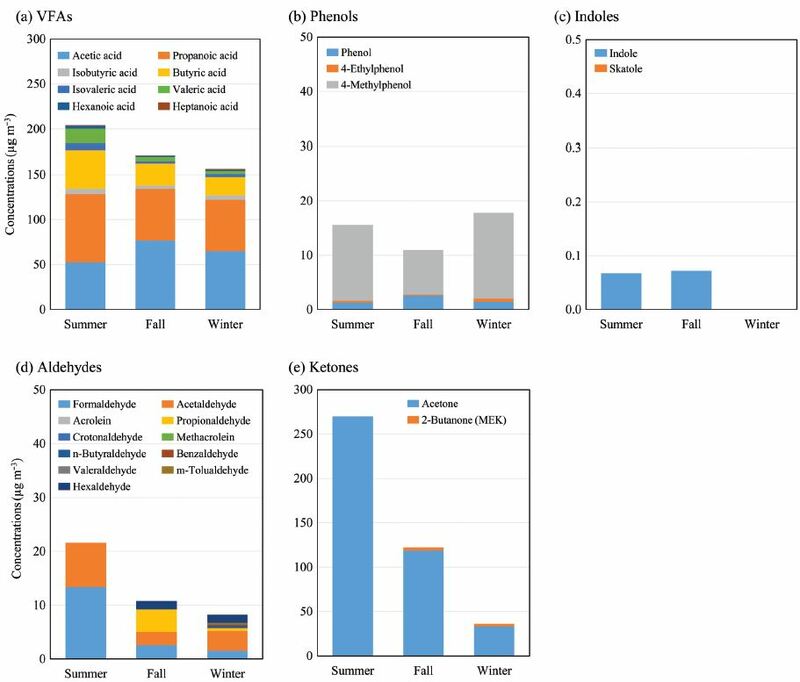 In addition, the difference in the amount of manure associated with the differences of the swine age among the seasons might also affect the seasonal variations of the VOC emission rates. Especially in fall, the ratio of reared swine under 30 kg head-1 was high. Assuming that the amount of manure excreted by swine under 30 kg head-1 was 1.5 kg (day per head)-1 and for swine over 30 kg head-1 was 5.7 kg (day per head)-1 (Tsuiki et al., 1997), the amount of manure in fall was estimated as 108 kg day-1, which is smaller than the value for winter (125 kg day-1). Moreover, as the amount of manure becomes larger, the emission rates of VOCs will increase. Thus, the difference in the amount of manure might affect the seasonal variations of emission rates for VOCs. Additionally, different seasonal variations were observed in the emission rates of each compound. 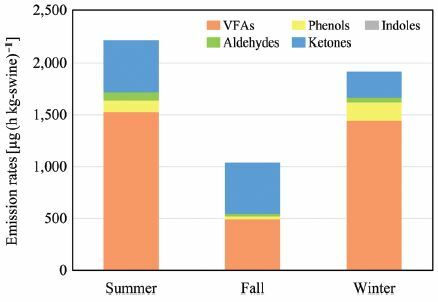 For example, the emission rates of VFAs in the summer were close to those in the fall, whereas the emission rates of ketones in the summer were about two times larger than those in the winter. These volatile compounds are produced from different precursors according to different pathways of microbial degradation and are emitted from various sources such as manure, breath, and body surface. Therefore, emissions of VOCs might have been influenced by variations in temperature. The estimated amount of total annual emissions of VOCs from one swine shed, based on the emission rate for each season, was 4.7×103 g year-1 in summer, 1.4×103 g year-1 in fall, and 2.3×103 g year-1 in winter. In Japan, about 1×107 swine are raised on an annual basis (Ministry of Agriculture, Forestry and Fisheries, Japan, 2016); hence, the national annual emissions of VOCs from swine might not be negligible. However, there may well be differences in emissions of VOCs from all the other swine rearing facilities in Japan, depending on the breed of the swine and breeding methods used. Thus, the overall error in the results for this study could be large. It would, therefore, be beneficial to perform further research at more swine sheds in the future. The concentrations and chemical composition of VOCs, which are the main excretory components generated by swine, were investigated in a swine shed. In addition, the emission rates of VOCs from the swine shed and the annual emission of VOCs in Japan were evaluated. The mean VOC concentrations were 511.3 μg m-3 in summer, 315.5 μg m-3 in fall, and 218.6 μg m-3 in winter, decreasing slightly from summer to winter. Acetone, acetic acid, propionic acid, and butyric acid were the predominant components of the VOCs, accounting for 80-88% of the total VOCs. 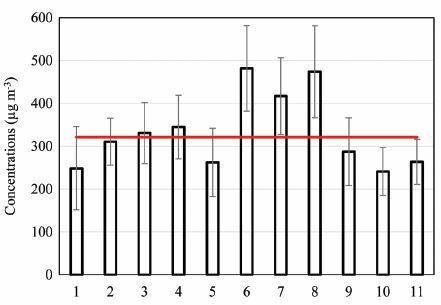 Hourly variations in VOC concentrations in fall and winter suggest that VOC concentrations were influenced by many factors, such as the ventilation of the swine shed, the physical activity of the swine, and the temperature in the swine shed. Mean emission rates of VOCs from the swine shed in each season were estimated as 1-2×103 μg (h kg-swine)-1. The highest emission rates of VOCs were in summer, followed by winter and then fall. The authors thank Mr. Y. Ando (Asahi Agricultural High School, Japan) for support in sampling, Mr. S. Fukumori (Electric Power Engineering Systems Co., Ltd., Japan) for assistance in sample collection and sample preparation, and Mr. J. Saito and Ms. A. Kubota (Waseda University Environmental Safety Center, Japan) for technical support in TD-GC/MS and HPLC analysis. Alains, P., Ashkan, S., Krauter, C., Campbell, S., Hasson, A.S., (2010), Emissions of volatile fatty acids from feed at dairy facilities, Atmospheric Environment, 44, p5084-5092. Bond, T.E., Kelly, C.F., Heitman, H. Jr., (1959), Hog House Air Conditioning and Ventilation Data, American Society of Agricultural and Biological Engineers, 2, p1. CDPR, (2006), Pesticide air initiative: Strategy to reduce toxic and volatile organic compound emissions from agricultural and commercial structural pesticides. De More, W.B., Sander, S.P., Golden, D.M., Hampson, R.F., Kurylo, M.J., Howard, C.J., Ravishankara, A.R., Kolb, C.E., Molina, M.J., (1994), Chemical Kinetics and Photochemical Data for Use in Stratospheric Modeling, Jet Propulsion Laboratory Publication 97-4. Dohkoshi, J., Urano, S., Katayama, S., Hoshiba, S., (1983), Comparative Study on the Animal Environment and the Productivity in two Different Structures of Swine Houses, School of Agriculture of Hokkaido University, 131, p517-541, (in Japanese). Feilberg, A., Liu, D., Adamsen, A.P.S., Hansen, M.J., Jonasse, K.E.N., (2012), Odorant Emissions from Intensive Pig Production Measured by Online Proton-Transfer-Reaction Mass Spectrometry, Environmental Science & Technology, 44, p5894-5900. Huffel, K.V., Hansen, M.J., Feilberg, A., Liu, D., Langenhove, H.V., (2016), Level and distribution of odorous compounds in pig exhaust air from combined room and pit ventilation, Agriculture, Ecosystems & Environment, 218, p209-219. Mårtensson, L., Magnusson, M., Shen, Y., Jönsson, J.Å., (1999), Air concentrations of volatile organic acids in confined animal buildings-determination with ion chromatography, Agriculture, Ecosystems & Environment, 75, p101-108. Ministry of Agriculture, Forestry and Fisheries: Statistical data of stockbreeding in Japan in 2016, URL: http://www.maff.go.jp/j/tokei/sokuhou/tikusan_16/ (Accessed 7 Jan. 2017), (in Japanese). Ministry of the Environment: Atmospheric pollution level in Japan in 2014, URL: http://www.env.go.jp/press/files/jp/102406.pdf (Accessed 7 Jan. 2017), (in Japanese). Nga, L., Richard, C., Flagan, C., Seinfeld, J.H., (2005), Cloud condensation nucleus activation properties of biogenic secondary organic aerosol, Journal of Geophysical Research: Atmospheres, 110, D07206. Tsuiki, M., Harada, Y., (1997), Investigations of excretion of livestock and future tasks in Japan. Environmental safety and new stockbreeding, Japan Association for Techno-innovation in Agriculture, Forestry and Fisheries, 15, (in Japanese). 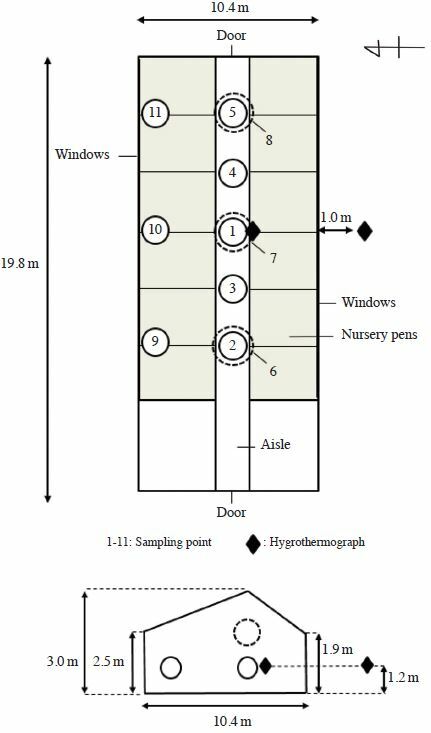 Urano, S., Katayama, S., (1985), A method to measure the ventilation rate by using the water vapour balance in a livestock house, Journal of the Society of Agricultural Structures, 15, p16-23, (in Japanese). Composition of the swine feed during the sampling terms. Detection limit (ng) of each compound in this study. *ADuring sampling campaign in fall, number and total weight of swine changed at noon Oct. 12, 2016. *CVentilation rates were estimated from the temperature and RH inside/outside of the swine shed. *DIn: Measured inside the swine shed. *EOut: Measured outside the swine shed. *FDifference: Average of the difference between each datum of temperature/RH simultaneously collected inside and outside of the swine shed. n: The number of samples. **The average of VOC concentrations below the detection limit were transcribed as “ND”. Detection limits for aldehydes and ketones were different for each sample because the sampling time of each sample was different.